Jay Robb Non-GMO Egg White Protein powder is unique and famous for its natural flavor systems. The egg white protein raw material is derived from chickens not treated with growth hormones. The protein is flash pasteurized for safety, with no additional heating used during the final processing. 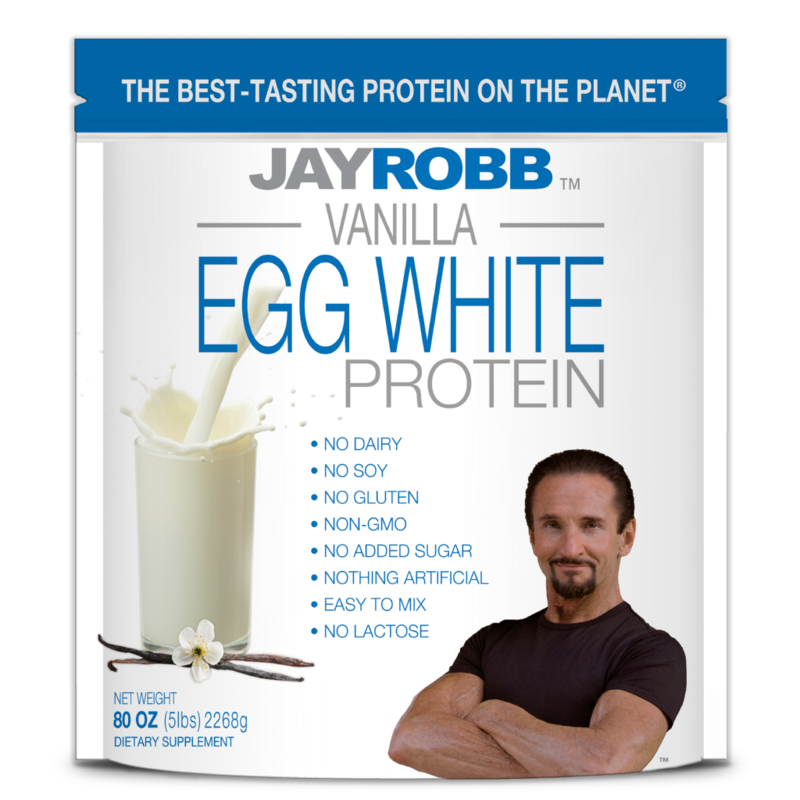 Made from the finest natural ingredients available, Jay Robb Non-GMO Vanilla Egg White Protein powder delivers 24 grams of first class protein, 0g fat, 5mg cholesterol, <1g sugars, and only 4 grams of carbohydrate per 33 gram serving. One taste of our easy-to-mix delicious Non-GMO Vanilla Egg White Protein powder, and you will be a fan for life! Jay Robb is going green and is now selling resealable bags for all sizes of our whey protein powder. If you still prefer to store your protein powder in a canister, then please purchase our empty 24 oz. re-fill canister (see below). Thank you for supporting our steps towards improving our environment. Vanilla: Egg albumen, Xylitol, Natural flavor, Sunflower lecithin, Xanthan gum, and Stevia leaf extract (Rebaudioside A). Chocolate: Egg albumen, Xylitol, Cocoa, Natural flavor, Sunflower lecithin, Xanthan gum, and Stevia leaf extract (Rebaudioside A). Strawberry: Egg albumen, Xylitol, Natural flavors, Sunflower lecithin, Xanthan gum, Stevia leaf extract (Rebaudioside A), Citric acid, and Red beet powder (for color). Contains: Egg. This product is processed in a facility that also processes Milk, Soy, Egg, Wheat, Tree Nuts.